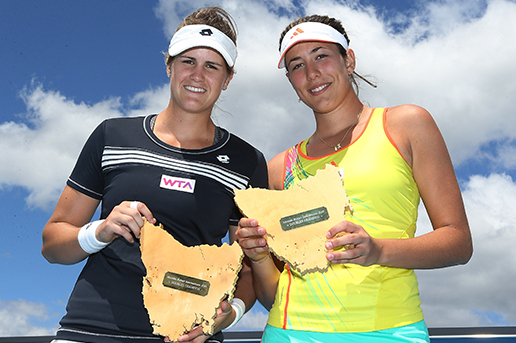 Garbine Muguruza and Maria-Teresa Torro-Flor are the Moorilla Hobart International doubles champions for 2013. The Spanish duo overcame the partnership of Luxembourgian Mandy Minella and Hungarian Timea Babos in straight sets 6-3 7-6(5) to take their maiden WTA doubles title. The tournament was the first time Muguruza and Torro-Flor had played doubles together so the pair came in with few expectations. Something just seemed to click for the two Spaniards this week though, overcoming Australian pair Vanessa Dobson and Karolina Wlodarczak in the first round before being granted a walkover over Jarmila Gajdosova and Klara Zakopolova. The No.2 seeds were were forced to withdrew after Zakopalova sustained an ankle injury. The Spaniards then defeated Ashleigh Barty and Bojana Bobusic in the semi finals. According to Muguruza the secret to the pair’s success is aggression. “This is the first time we played together so the only thing is to fight and to be aggressive and that’s the secret for us now,” said 19-year-old Muguruza. In what was a very entertaining match, Muguruza and Torro-Flor captured the first break of the match courtesy of a double fault and a couple of costly miss hits by Babos on serve. Babos and Minella had the better of the break point opportunities in the first set but were not able to capitalise, giving up three break point opportunities in the ninth game of the set to allow the Spanish pair to take the opening set 6-3. Babos’ serving troubles continued in the second set with two double faults handing Muguruza and Torro-Flor the break at 3-2. A unforced error by Torro-Flor at 30-15 in the eighth game let Babos and Minella back into the match as they broke back to level at 4-4. With Torro-Flor serving for the match at 6-5, Minella scrambled to reach a Muguruza forehand before sending it back down the line to take the game and force the match to a tiebreak. In the tiebreak both pairs battled hard, but in the end it was the Spaniards who came out on top, taking the tiebreak 7-5. “It’s special for us, first time I play with Garbine, we are so happy and I feel good playing with her,” said the 20-year-old Torro-Flor. “It’s important because playing doubles also makes you play better in singles,” she added. “We want to play together again, I feel very comfortable playing with Maria-Teresa,” said Muguruza.